I just returned from a trip to Seattle (which I hope to share some details of soon, as there was so much amazing food and beer there! ), which means I didn't have much time to think about Valentine's Day until I returned yesterday and got straight to work making a heart-shaped recipe! 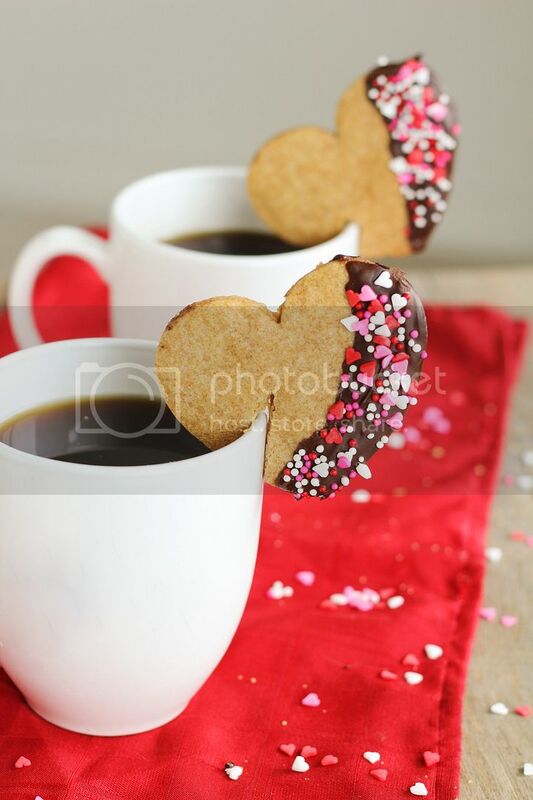 I know a lot of people aren't fans of the holiday and are sick of seeing heart-shaped things, but I think they're adorable, and whether you share heart cookies with your significant other, your family, friends, coworkers, or even just treat yourself, I think that making time for love, sharing, and cookies is a good thing! I originally got the idea for "mug hugger" cookies from Red Path Sugar, and loved that you can hang a cookie on your mug! And because my mug is usually full of (strong, black) coffee, I decided to make espresso shortbread cookies instead of sugar cookies (also because I love shortbread). And because it's almost Valentine's Day, I had to dip them in chocolate and cover them in red and pink sprinkles, of course! The chocolate actually helps add some sweetness to an otherwise not-so-sweet cookie, so don't skip that step! You can skip the sprinkles if you really want, but why would you want to?! 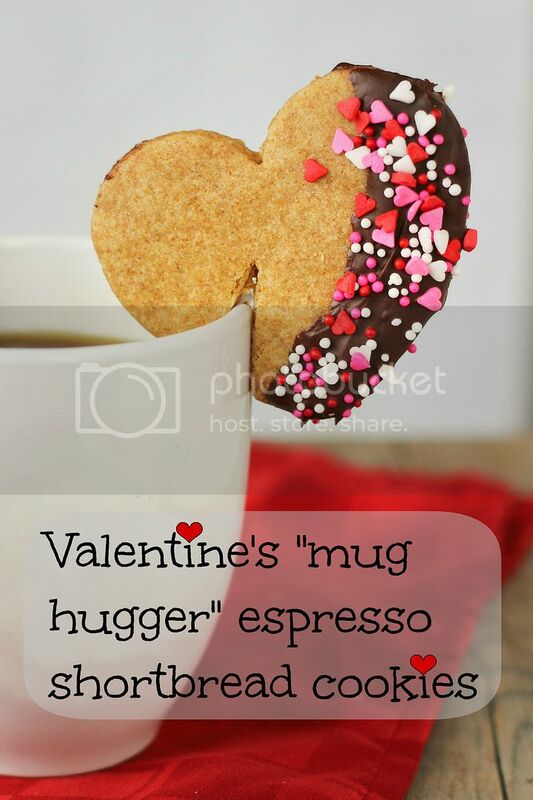 In order to make these "mug huggers", you just have to cut a little slot in the cookie, preferably as soon as it comes out of the oven while it's still soft, then hook it onto your mug! To be perfectly honest, these cookies might not stay on your mug too long; mine tended to fall off every few minutes as I was taking photos, which often resulted in broken cookies. You can easily forget the mug hugger part and just make these as regular cookies if you want, which will be just as good, but if you serve someone their morning (or afternoon) coffee with one of these guys attached, you're sure to brighten their day! Cream butter and sugar in the bowl of a stand mixer (using paddle attachment) on medium speed until combined, about 1-2 minutes. In a separate bowl, whisk together the flour, espresso powder, and salt. With the mixer on low, add the dry ingredients on low speed, scraping the bowl frequently, until just incorporated. Add the vanilla and mix until just incorporated again, and the dough has just started to come together. Don’t overmix. On a lightly floured surface, roll the dough to about 1/4 inch thick. 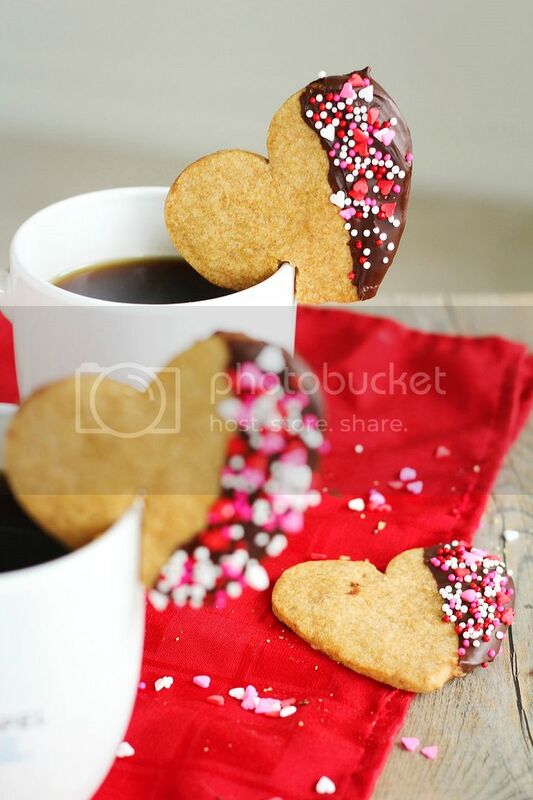 Use a heart shaped cookie cutter to cut out shapes, rerolling the dough until it is all used up. I used about a 3” cookie cutter which is a bit big for a mug; I’d recommend using a smaller cookie cutter if possible. Arrange the cookies carefully on a parchment paper lined baking sheet and refrigerate the baking sheet until dough is chilled, at least 30 minutes. Meanwhile, preheat the oven to 325°F. Bake the cookies in preheated oven for about 18-20 minutes, until golden on bottom. Remove from oven, and if you want to make these "mug hugger" cookies, now is the point where you would cut little slits into the cookies so they can hang on a mug. If you do this before the cookies bake, they will puff up over the cut-out, and if you wait until they have cooled, the cookies will break when you try to cut them. 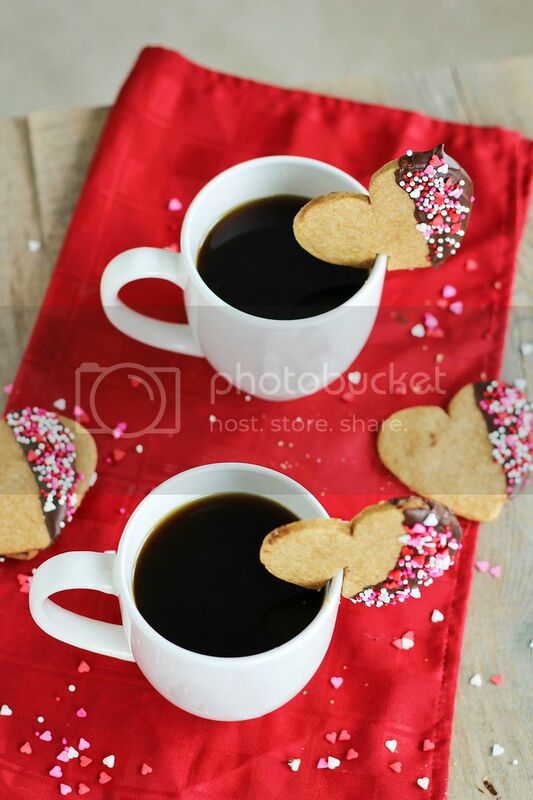 While they are still soft from the oven, use a sharp knife to cut a slit in the edge of a cookie just long and wide enough for it to fit over a mug (see pictures for an idea). Let cool on baking sheet for about 5 minutes, then transfer to a wire rack to cool completely. Melt chocolate chips in a double boiler or a small heatproof bowl set over a pan of simmering water. Transfer to a small container and dip the edges of each cookie in the chocolate. Try to only dip the top half of the cookies and keep the chocolate layer thin so it won't end up overpowering the cookie. Immediately sprinkle the chocolate covered portion with sprinkles, if using. Set cookies back on parchment paper until chocolate is set, about 2 hours. Then keep covered in a container. *Note: I did try to cut some cookies into mug huggers after they had cooled; many broke, but if I cut only a tiny bit at a time and was very gentle, I could cut out a slot just big enough so the cookie could fit on a mug. In the pictures, the cookie in front was cut out right from the oven and the cookie in behind was cut after it had cooled.